The rich silver mines of Cerro Gordo, high in the Inyo Mountains, transformed the pueblo of Los Angeles into a busyy center of commerce. This challenging and rewarding route follows the path of ore and supplies as it brings you to breathtaking heights. Bizarrely-shaped boulders and pinnacles of stone; behind them the snow-capped peaks of the High Sierra - no wonder the Alabama Hills have been the setting for hundreds of films - depicting deserts of the oldwest, the far east, and even distant galaxies! The top of this road is base camp for those with permits to climb the highest point in the contiguous 48 states. From the valley floor to the towering summit, local people, Hollywood Stars and the state and federal government have all vied for roles in the history of this vertical slice of eastern California. Would you love to hike in the mountains without trudging up a steep trail? This route takes you to one of the highest road-ends in the Sierra, at an elevation of nearly 10,000 fteet. From here gentle trails wend through meadows surrounded by glacier-carved granite peaks and brilliant mountain light. This vast, flat stretch of the Owens Valley floor has a strange, sad beauty of its own. Dreams and despair blow in the dust from deserted farmlands, abandoned railroads and the remains of a wartime intermitant camp. Still, the enduring mountains and everchanging sky look down on tough desert plants and animals that prevail through all but the hardest of times. EVERY EASTERN SIERRA DESERT TOWN HAS AT LEAST ONE SUMMER ESCAPE ROUTE TO THE HIGH COUNTRY. FROM INDEPENDENCE YOU CAN TAKE THE ONION VALLEY ROAD AND IN LESS THAN AN HOUR BE AMONG MOUNTAIN MEADOWS SHADED BY TALL PINES AND QUAKING ASPENS, ECHOING WITH BIRDSONG AND COOLED BY THE SPRAY OF WATERFALLS. HERE IS A ROUTE TO SWIFTLY SWEEP YOU FROM THE SUN-BAKED VALLEY FLOOR INTO A COOL OAK GROVE HIGH ON THE SIERRA SLOPE. BRING A PICNIC AND ENJOY THE SHADY OAKS—QUITE RARE HERE ON THE EASTERN SIDE OF THE MOUNTAINS—AND STUPENDOUS VIEWS. THIS HIDDEN CANYON IS YOUR ENTRYWAY INTO THE WILD INYOMOUNTAINS. CLIMBING AMID OLD MINES, CACTUS SPINES AND PINYON PINES, THE ROAD FORMS THE BORDER OF A LITTLE-VISITED WILDERNESS AND BRINGS YOU WITHIN HIKING DISTANCE OF 9,941-FOOT MAZOURKA PEAK. THIS EASY ROUTE TAKES YOU LESS THAN A MILE FROM TODAY’S HWY. 395 BUT MORE THAN A CENTURY INTO THE PAST — BACK TO A TIME WHEN THE MAIN ROADWAY THROUGH THE EASTERN SIERRA WAS NOTHING BUT A PAIR OF WAGON TRACKS. 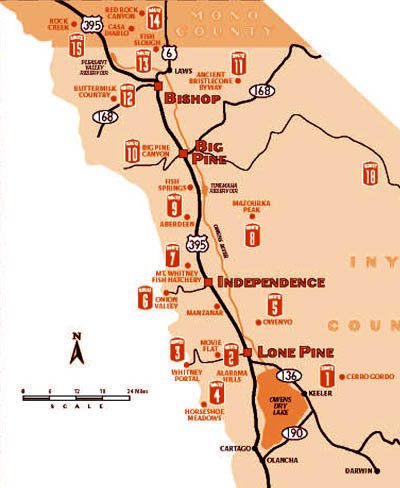 TAKE THIS PRE-1962 ROUTE TO SEE SPECTACULAR SCENERY AT A LEISURELY PACE, WITH THE GHOSTS OF FRUIT FARMERS AND PROSPECTORS AS YOUR FELLOW TRAVELERS. WITNESS THE WORK OF THE ICE AGE ON THIS ROUTE INTO THE GLACIER-CARVED HIGH SIERRA. HERE THE POWERFUL FORCES OF NATURE EASILY OVERWHELM THE TEMPORARY TOUCH OF HUMANKIND—AS SHOWN BY A MOUNTAIN RESORT THAT HAS BEEN ERASED THREE TIMES BY FIRE AND ICE. IT’S THE VERY HARSHNESS OF THE ANCIENT BRISTLECONE FOREST ON THE CREST OF THE WHITE MOUNTAINS THAT ENABLES THE WORLD’S OLDEST KNOWN LIVING TREES TO SURVIVE FOR THOUSANDS OF YEARS. AT ROUTE’S END IN THE WINDSWEPT PATRIARCH GROVE AT 11,200 FEET, VIOLENT STORMS ALTERNATE WITH STILLNESS, SILENCE AND INCREDIBLY CLEAR LIGHT. 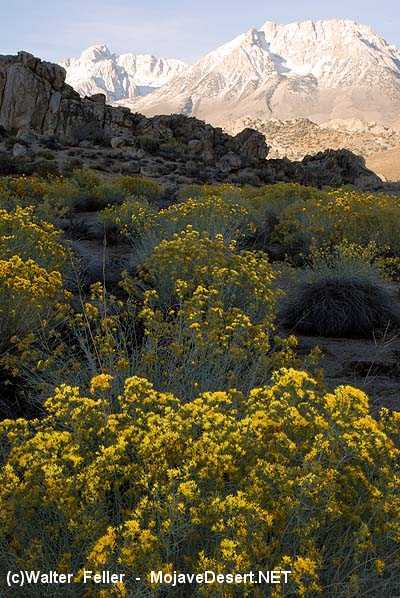 A LOVELY SURPRISE TUCKED INTO THE BASE OF THE SIERRA NEAR BISHOP, THE PICTURESQUE BOULDERS OF THE BUTTERMILK COUNTRY ARE SUPERB YEAR-ROUND BUT UNSURPASSED IN LATE SPRING AND EARLY SUMMER WHEN THE AIR IS FULL OF BIRDSONG AND THE SCENT OF WILDFLOWERS. BOTH OF THESE ROUTES BEGIN WITH A RARE DESERT WETLAND WITHIN THE STARK GEOLOGICAL WONDERS OF THE VOLCANIC TABLELAND. BOTH END BY SWOOPING YOU DOWN FROM THE HIGH POINT OF THE TABLELAND, CASA DIABLO MOUNTAIN. IN BETWEEN, TAKE ROUTE 13 THROUGH A COLORFUL, RUGGED LANDSCAPE; OR FOLLOW ROUTE 14 THROUGH A LIVING GHOST TOWN. CLIMB THROUGH AN AWESOME VOLCANIC DESERT INTO A COOL WOODLAND WHERE TALL PINES GROW AMONG THE ODDLY-SHAPED LAVA ROCKS. DESCEND ALONG A FAST-FLOWING, TREE-LINED CREEK, AND SEE IF YOU AGREE WITH AN EARLY EXPLORER THAT YOU ARE IN ONE OF THE MOST BEAUTIFUL PLACES ON EARTH. THIS FASCINATING ROUTE TAKES YOU FAR INTO QUIET, HIDDEN PLACES STEEPED IN A RICH HISTORY. IT CAN BE DRIVEN IN AN HOUR BUT ALLOW A FULL DAY TO EXPLORE THE CHARMS OF SHOSHONE, HOT SPRINGS, DATE PALMS, RIVERS AND WETLANDS, WILD CACTUS-STUDDED MOUNTAINS, AND THE OLD WAGON TRAIL. THIS IS THE ROUTE FOR YOU IF YOU WANT TO SEE DEATH VALLEY OFF THE BEATEN TRACK, SPENDING MOST OF YOUR TIME ON DIRT ROADS, TAKING IN SOME OF THE MOST POPULAR SIGHTS AND SOME OF THE MOST HIDDEN AND OBSCURE. 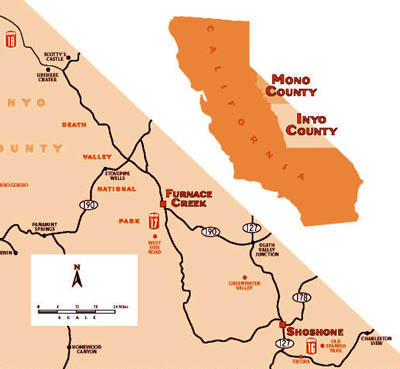 YOU CAN DO ALL IN ONE LONG DAY OR MAKE TWO ROUTES OF IT, STARTING AT EITHER FURNACE CREEK OR SHOSHONE. THIS LONG, LITTLE-TRAVELED, ADVENTUROUS ROUTE IS THE NORTHWEST PASSAGE INTO DEATH VALLEY NATIONAL PARK, CROSSING TWO MOUNTAIN RANGES AND LINKING TWO GREAT NORTH AMERICAN DESERTS. WITHIN THE PARK IT BRINGS YOU TO THE COLORFUL GEOLOGY OF UBEHEBE CRATER AND THE EQUALLY COLORFUL HISTORY OF SCOTTY’S CASTLE. As a visitor to the Eastern Sierra and Death Valley, you have a responsibility for your personal safety during activities you might pursue. Natural hazards exist. It is your responsibility to know the hazards involved and to use the proper safety precautions to minimize the inherent risks of your activities. Various laws, regulations and restrictions apply to the activities and areas mentioned in this guide, in order to protect natural and cultural resources and for user safety and enjoyment. It is your responsibility to learn and follow applicable restrictions. Contact appropriate agencies for information. The SUV guide is a cooperative effort of the Eastern Sierra Interpretive Association and it partners and friends: the Bureau of Land Management - Bishop Field Office, the California State Parks - Off-Highway Motor Vehicle Recreation Division, the Coalition of Chambers of Commerce of Inyo County, the County of Inyo, Death Valley National Park, Inyo National Forest - White Mountain Mt. Whitney Ranger Districts and the City of Los Angeles Department of Water and Power. A special thanks goes out to all the individuals who contributed towards the development, writing, editing, design and production of this document.